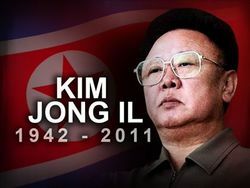 Pyongyang, North Korea -- Dear people of the glorious Popular Republic of North Korea, it is with great regret and infinite sadness that your beloved Department of Propaganda wishes to inform you that our Supreme Leader, Kim Jong-il, passed away today. Our infinitely wise Emperor fell victim to an insidious heart attack due to an electrical hazard as he was changing the CD of his boombox while he was bathing in his 24 carat gold bathtub while riding a train. No need to say that the CD player and all its extended family will be tortured and executed tomorrow in the downtown city square. Witnesses who rushed to the scene at the sound of the high-pitched screams said that Kim Jong-il's ultimate vocal performance reminded them of a nightingale's melodious singing and that the Commander was as gracious in death as he had been his whole life. Our Dear Leader began to emit rose-scented smoke which engulfed the room with its magnificient aroma while his holy body was burning to a crisp. His close guard witnessed in awe as a flock of white doves entered the room and transported the toasted saint in a flight toward the firmament to meet his father and former benevolent ruler of us all, Eternal President Kim Il-sung. Soon, tulip petals began raining from the heavens, and a general of our almighty army was hit by a falling set of gold teeth which formerly graced the mouth of our King. He will always be remembered for protecting North Koreans from the harmful and depraved products utilized by the wretched westerners, sacrificing himself to a great extent since he was the only person in the country to use them. His tremendous altruism allowed us to feast on one meal which included meat per year, namely on his birthday. His son and successor Kim Jong-un promised to be a most generous leader adored by all the North Korean people for his high moral values and as such, decided to execute 1,000 deserters' family members to commemorate his father's passing. He wished to quell the deep worries of the masses by reassuring his great subjects: you can expect more of this kind of generosity as his rule over North Korea unfolds. They just fail to say he was transported by birds to the sky, but since it's a westerner's news outlet, what did you expect? This page was last edited on 5 June 2012, at 07:12.